Our law firm is widely regarded as a pioneer in warranty parts reimbursement as we litigated against the largest manufacturers. After recovering seven (7) figure retroactive warranty payments for our clients, the manufacturers responded by negotiating legislation in several states which allowed for prospective payments at retail. One Low Flat Fee. NEVER a Contingency. Call 516-873-3000 or Complete Our Contact Form! The process however is time consuming and complicated. Many dealers lose money in several ways by doing this in-house. The amount of money at issue is far too substantial not to hire an attorney with extensive experience in these matters. Our law firm knows how to identify the highest yielding qualifying sequential repair orders out of the thousands within a multi-month period. Even the best service or parts managers can rarely do this, nor should they spend a month of their time away from their regular duties. Our low flat fee is generally recouped within the first month of receiving reimbursement at retail. Your manufacturer does not need to know you have retained us. There has been no reported factory retaliation or increased audits from our clients. Ask us for references. There are no excuses for not obtaining this revenue. 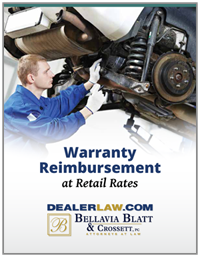 Bellavia Blatt’s Warranty Reimbursement Program? call 516-873-3000 or complete our Contact Form. One of our Warranty Processing Specialists will contact you promptly.